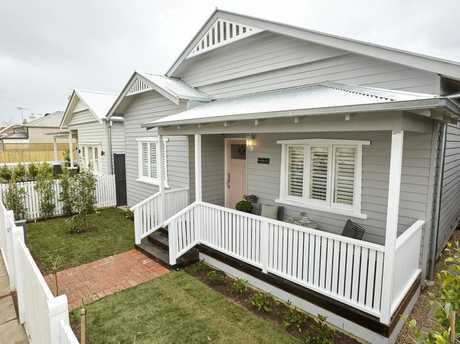 THE Block's home are officially completed after the teams called tools down on their final week of work in Elsternwick. 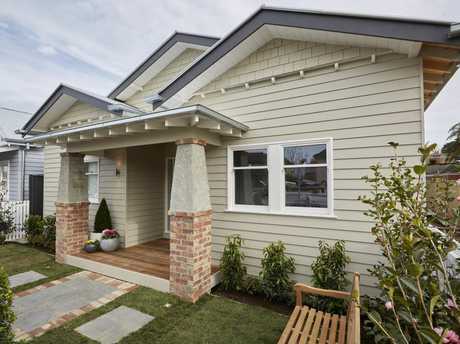 The judges praised the mates for the best first impression out of the five homes, which most accurately reflected the style buyers can expect to find inside the home. "They've gone through the house with that beautiful Scandinavian brushstroke and this is perfect; it's all it needed to be," Neale Whitaker said. "Sticks and Wombat haven't given their house a name. They don't need one because it's all like one big welcome mat." Pipped by just half a point, runners up Jason and Sarah have managed to go through an entire season of The Block without winning a single room reveal. The judges were glowing in their critique of the heritage garden and restored, art deco-style front door. 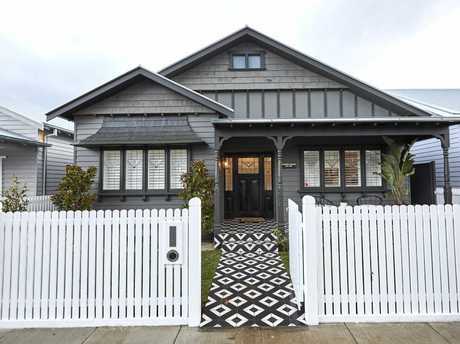 Jason and Sarah's classic front facade earned them plenty of praise. "Jason and Sarah have shown such respect for the age and heritage of the building," Neale said. 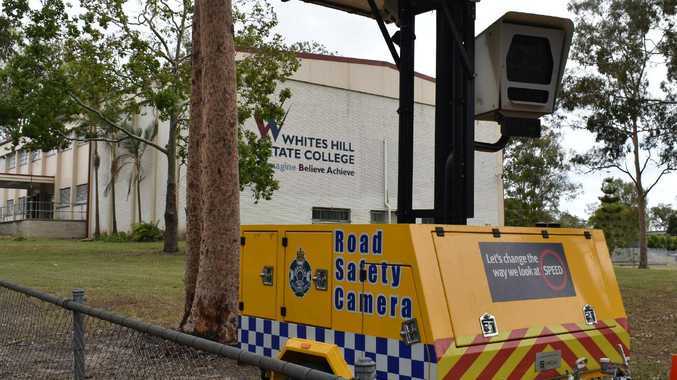 "They haven't tried to update or modernise. The history of the house speaks for itself and it's beautiful. "I reckon this is going to be here for another 100 years." Josh and Elyse were shocked to finish third after the judges slammed their traditional brick columns and 'granny' style planting. "This feels like Nan's home," Shaynna Blaze said. "I absolutely adore this entry; the flowering and hedging is perfect. It's beautiful, but I don't think it matches the house. Josh and Elyse divided the judges with their old-fashioned front garden. "One thing we've loved about Josh and Elyse is the consistency of their look all the way through. Out here it's very old fashioned but not in the boho way they've done (inside)." Neale agreed: "I hate these (the pillars). I find them so ugly. I know they're authentic and I know they're a feature that probably would have belonged to this style of house but sometimes history gives you permission to rewrite it." Ronnie and Georgia also failed to impress with their dark grey paint colour and bold geometric tiles. "I'm actually surprise they've made such a bold design statement with the exterior," Neale said. Ronnie and Georgia hope there is a buyer for their dark grey house. "When I look at that beautiful lead lighting (in the windows), which we've admired all the way through The Block, why do you need to detract from it with this tile? All I notice now is the tile. "They're obviously going for wow factor but I'm just not sure it's working in the way I expected it to." Reno rookies Hannah and Clint finished the season they way they started, on the bottom of the ladder. 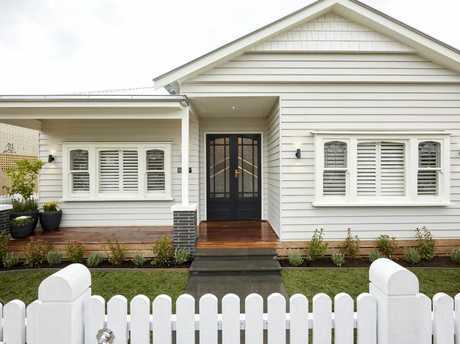 While Shaynna loved their blush pink door and nod to the man who built the original home, she said the front yard lacked the sophistication of some of the other homes. Hannah and Clint make a nice first impression with their pink door. "It doesn't have quite the level of finesse that Jason and Sarah's did. 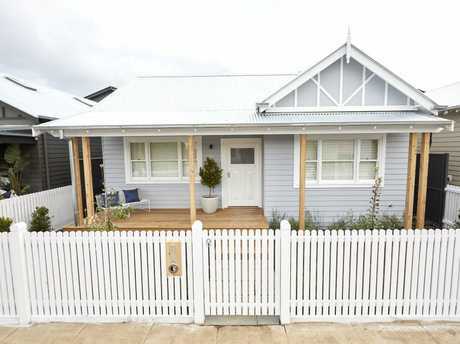 It still has heaps of personality but it isn't quite as on the money as next door," she said. "You can imagine just sitting here, though, and you've got that bit of extra privacy that next door doesn't have." With the hard work behind them, the teams can now look forward to meeting the public when their homes open for inspections ahead of next weekend's auctions. The five-bedroom homes, all with three-car garages, are expected to fetch more than $2.4 million when they go under the hammer.